I went online power shopping this weekend and spent a few hours yesterday playing with my new toys. And as usual I want to share some of the results with you. 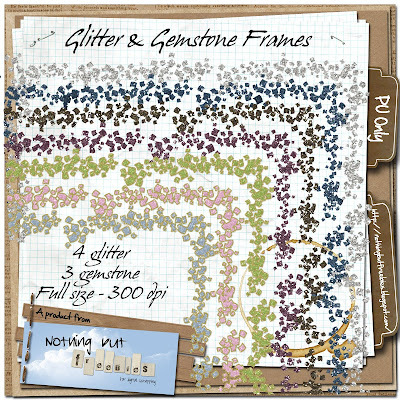 Today you get a bunch of glitter- and gemstone-confetti frames - hope you like! Click on image to download - and please excuse me for the size of the zip… If you have difficulties downloading the 44 MB let me know, and I will try to help you with split zip files. I’m back with more play results on Wednesday. See you then? Thank you so much for this post. I want to let you know that I posted a link to your blog in CBH Digital Scrapbooking Freebies, under the Page 6 post on Jul. 26, 2010. Thanks again. Thank you so much. I'm sure I'll use these after out next trip to Disneyland. Thank you, thank you. The only thing I love better than glitter is pixie dust! Thank you veru much for these very nice glitter frames !